Texas House members overwhelmingly gave tentative approval to a sweeping border-security measure on Wednesday that would increase the number of state troopers on the border and establish a catchall intelligence center in Hidalgo County. Texas House members overwhelmingly gave tentative approval to a sweeping border-security measure on Wednesday following about four hours of debate on the measure’s costs, accountability mechanisms and whether it will stain the image of border cities. House Bill 11 by state Rep. Dennis Bonnen, R-Angleton, would increase over two years the number of Texas Department of Public Safety officers on the border, establish a catchall intelligence center in Hidalgo County to analyze border crime data and create a voluntary corps of retired DPS officers to bolster the agency’s ranks. It would also increase penalties for human smuggling, and require DPS to study the usefulness of southbound checkpoints within 250 yards of the border to screen for guns and illicit cash headed to Mexico. The measure passed 131 to 12 but drove a wedge between some House Democrats. Some argued that HB 11 is needed to address drug cartel crime in Texas, while others said the bill gives state police too much power and costs too much. State Rep. Eddie Lucio III, D-Brownsville, a bill co-author, said he was born and raised on the border and years ago would have never thought he’d support a measure that sends more law enforcement to the region. But the threats have now hit home, he said. Unlike some of his colleagues from El Paso, Lucio said he supported southbound checkpoints and said the bill didn’t go far enough on that issue – but said it was a start. State Rep. Armando Walle, D-Houston, offered seven amendments that would have affected issues ranging from federal pre-emption of immigration laws to DPS’s purchasing practices. Bonnen said the measure would create a steady border security plan instead of the patchwork system in place now. Since last summer, hundreds of DPS officers have been rotated in and out of the region every week, which DPS officials said is effective but inefficient and expensive. “This bill says we’re going to have an intelligent plan to create a consistency that Texans on the border and across the state can count on,” he said. Part of the plan includes hiring peace officers with four years of experience as Trooper II DPS officers, a rank paying about $60,000. That’s stoked concerns that the statewide police force could poach talented officers from local agencies. An amendment requiring DPS to assist local police handling crimes that are at least third-degree felonies was adopted as a short-term solution. Texas DPS Director Steve McCraw has also told lawmakers he’d ensure his agency works with local officers to prevent depleting their ranks. The omnibus measure currently has a price tag of $4.1 million through the next biennium. That prompted opponents of the bill to question what was being proposed to make sure the money is well spent. State Rep. Trey Martinez Fischer, D-San Antonio, successfully added a measure creating a Border Operations Legislative Oversight Committee that would investigate the operations of law enforcement on the border. That includes obtaining reports on the how monies for training, equipment and salaries are being spent. One of the thorniest issues for lawmakers was an amendment by state Rep. Jose Manuel Lozano, R-Kingsville, that sought to eliminate a provision that a person must be engaged in smuggling for profit in order to be prosecuted. During a committee hearing last week, state Rep. Joe Moody, D-El Paso, added the clarifying language in order to allay concerns raised by faith-based groups that feared they would be arrested and possibly charged for simply driving an undocumented immigrant to church services. Lozano argued that the only proof a smuggler is being paid comes from the person smuggled. That can’t happen when the person is left for dead in the brutal Texas heat, he said. Bonnen said there was concern that the language wasn’t clear enough on who can be prosecuted. But the issue could re-emerge in the Texas Senate, which voted the companion to Bonnen’s bill, SB 3, out of a subcommittee on Monday. Moody said its essential the language stays in. Border lawmakers also had concerns over the data center, dubbed in the bill as a Texas Transnational Intelligence Center. State Rep. Cesar Blanco, D-El Paso, voted against the bill and argued the center would stain the border’s reputation because of its sole focus on border crime. “The City of El Paso consistently ranks as having the lowest crime rate among large cities. The proposed border law sends the wrong message about our region and could hurt economic development and our ability to attract business and investments," he said in a statement. "If the intent of the law is to make the state safer, all law enforcement agencies, not just those in border counties, should be required to report to their crime data to this center." 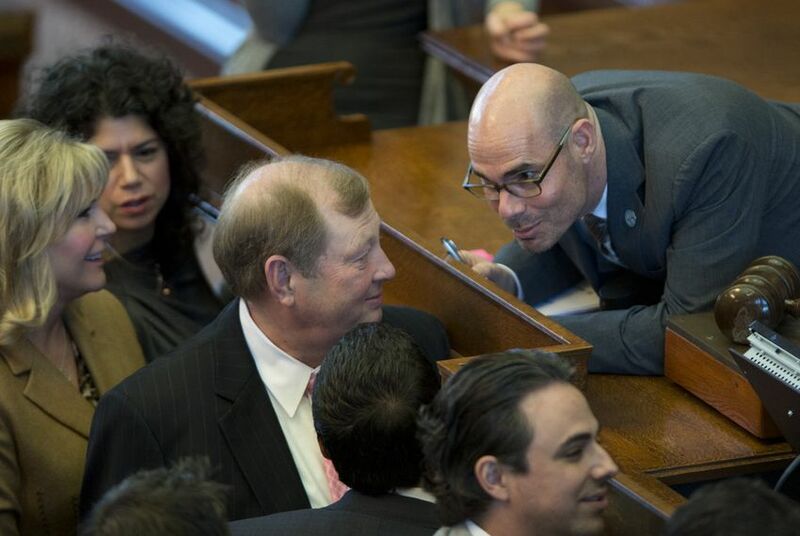 During the floor debate, Bonnen said that isn’t the intent.